This Teacher Resource Guide has been developed to provide supporting materials to help educators successfully implement the Indiana Academic Standards for Grade 8. 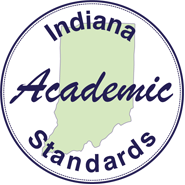 These resources are provided to help you in your work to ensure all students meet the rigorous learning expectations set by the Indiana Academic Standards. Use of these resources are optional; teachers should decide which resources will work best in their classroom for their students. The resources on this webpage are for illustrative purposes only, to promote a base of clarity and common understanding. Each item illustrates a standard but please note that the resources are not intended to limit interpretation or classroom applications of the standards. The links compiled and posted on this webpage have been provided by classroom teachers, the Department of Education, and other sources. The IDOE has not attempted to evaluate any posted materials. They are offered as samples for your reference only and are not intended to represent the best or only approach to any particular issue. The IDOE does not control or guarantee the accuracy, relevance, timeliness, or completeness of information contained on a linked website; does not endorse the views expressed or services offered by the sponsor of a linked website; and cannot authorize the use of copyrighted materials contained in linked websites. Users must request such authorization from the sponsor of the linked website. 8.NS.1: Give examples of rational and irrational numbers and explain the difference between them. Understand that every number has a decimal expansion; for rational numbers, show that the decimal expansion terminates or repeats, and convert a decimal expansion that repeats into a rational number. 8.NS.2: Use rational approximations of irrational numbers to compare the size of irrational numbers, plot them approximately on a number line, and estimate the value of expressions involving irrational numbers. 8.NS.3: Given a numeric expression with common rational number bases and integer exponents, apply the properties of exponents to generate equivalent expressions. 8.NS.4: Use square root symbols to represent solutions to equations of the form x^2 = p, where p is a positive rational number. 8.C.1: Solve real-world problems with rational numbers by using multiple operations. 8.C.2: Solve real-world and other mathematical problems involving numbers expressed in scientific notation, including problems where both decimal and scientific notation are used. Interpret scientific notation that has been generated by technology, such as a scientific calculator, graphing calculator, or excel spreadsheet. 8.AF.1: Solve linear equations with rational number coefficients fluently, including equations whose solutions require expanding expressions using the distributive property and collecting like terms. Represent real-world problems using linear equations and inequalities in one variable and solve such problems. 8.AF.2: Give examples of linear equations in one variable with one solution, infinitely many solutions, or no solutions. Show which of these possibilities is the case by transforming a given equation into simpler forms, until an equivalent equation of the form x = a, a = a, or a = b results (where a and b are different numbers). 8.AF.3: Understand that a function assigns to each x-value (independent variable) exactly one y-value (dependent variable), and that the graph of a function is the set of ordered pairs (x,y). 8.AF.4: Describe qualitatively the functional relationship between two quantities by analyzing a graph (e.g., where the function is increasing or decreasing, linear or nonlinear, has a maximum or minimum value). Sketch a graph that exhibits the qualitative features of a function that has been verbally described. 8.AF.5: Interpret the equation y = mx + b as defining a linear function, whose graph is a straight line; give examples of functions that are not linear. Describe similarities and differences between linear and nonlinear functions from tables, graphs, verbal descriptions, and equations. 8.AF.6: Construct a function to model a linear relationship between two quantities given a verbal description, table of values, or graph. Recognize in y = mx + b that m is the slope (rate of change) and b is the y-intercept of the graph, and describe the meaning of each in the context of a problem. 8.AF.7: Compare properties of two linear functions given in different forms, such as a table of values, equation, verbal description, and graph (e.g., compare a distance-time graph to a distance-time equation to determine which of two moving objects has greater speed). How much is my cell phone plan? 8.AF.8: Understand that solutions to a system of two linear equations correspond to points of intersection of their graphs because points of intersection satisfy both equations simultaneously. Approximate the solution of a system of equations by graphing and interpreting the reasonableness of the approximation. 8.GM.1: Identify, define and describe attributes of three-dimensional geometric objects (right rectangular prisms, cylinders, cones, spheres, and pyramids). Explore the effects of slicing these objects using appropriate technology and describe the two-dimensional figure that results. 8.GM.2: Solve real-world and other mathematical problems involving volume of cones, spheres, and pyramids and surface area of spheres. 8.GM.3: Verify experimentally the properties of rotations, reflections, and translations, including: lines are mapped to lines, and line segments to line segments of the same length; angles are mapped to angles of the same measure; and parallel lines are mapped to parallel lines. 8.GM.4: Understand that a two-dimensional figure is congruent to another if the second can be obtained from the first by a sequence of rotations, reflections, and translations. Describe a sequence that exhibits the congruence between two given congruent figures. 8.GM.5: Understand that a two-dimensional figure is similar to another if the second can be obtained from the first by a sequence of rotations, reflections, translations, and dilations. Describe a sequence that exhibits the similarity between two given similar figures. 8.GM.6: Describe the effect of dilations, translations, rotations, and reflections on two-dimensional figures using coordinates. How Do Skytypers Write Messages? 8.GM.7: Use inductive reasoning to explain the Pythagorean relationship. 8.GM.8: Apply the Pythagorean Theorem to determine unknown side lengths in right triangles in real-world and other mathematical problems in two dimensions. 8.GM.9: Apply the Pythagorean Theorem to find the distance between two points in a coordinate plane. 8.DSP.1: Construct and interpret scatter plots for bivariate measurement data to investigate patterns of association between two quantitative variables. Describe patterns such as clustering, outliers, positive or negative association, linear association, and nonlinear association. 8.DSP.2: Know that straight lines are widely used to model relationships between two quantitative variables. For scatter plots that suggest a linear association, informally fit a straight line, and describe the model fit by judging the closeness of the data points to the line. 8.DSP.3: Write and use equations that model linear relationships to make predictions, including interpolation and extrapolation, in real-world situations involving bivariate measurement data; interpret the slope and y-intercept. 8.DSP.4: Understand that, just as with simple events, the probability of a compound event is the fraction of outcomes in the sample space for which the compound event occurs. Understand and use appropriate terminology to describe independent, dependent, complementary, and mutually exclusive events. 8.DSP.5: Represent sample spaces and find probabilities of compound events (independent and dependent) using methods, such as organized lists, tables, and tree diagrams. 8.DSP.6: For events with a large number of outcomes, understand the use of the multiplication counting principle. Develop the multiplication counting principle and apply it to situations with a large number of outcomes.